Last May, Montse Baylach was the lucky winner of grand prize from Victor Tomàs’s Charity Sweepstake, which included the experience of watching the last match of the ASOBAL League from the VIP area of the Palau Blaugrana stadium, meeting and taking photos with Victor after the game. Victor Tomas is not only the captain of FC Barcelona Handball but also a benevolent man, who running this campaign to raise fund for the foundation of the Barcelona Children Hospital. Montse has always been the biggest fan of Barça and all its sport, she follows the football league, basketball, even hockey but handball is still her favorite. 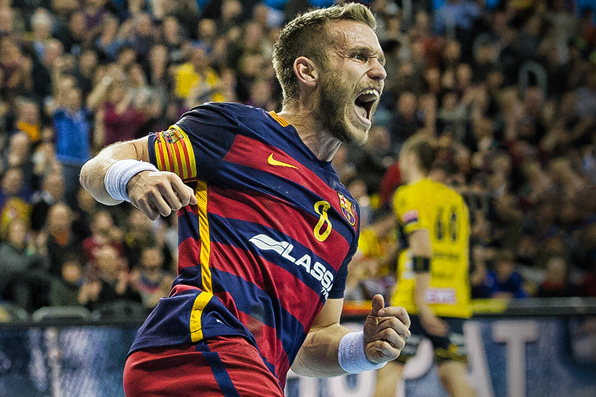 Especially because of the enthusiasm and affections that FCB Handball players show their fan. This is also a reason why when she knew about Víctor Tomàs´ campaign and its purpose to support Barcelona Children Hospital, she decided to participate without hesitation. Surprisingly, when she found out that she was the winner of the sweepstake, despite the facts that the prize included flight/train tickets, two nights in a high-class hotel and the transit fare from station/airport to the Palau Blaugrana stadium, she decided not to take it but instead donate the amount back to the charitable cause of the campaign. “I live near the Palau, and I also want to donate that part to help the Hospital and its cause” – Montse said. In excitement, Montse confessed to us that she would never expected to be a winner, so we were sure that we had helped to create an unforgettable memory for her on the 27th of May, 2017. The day Montse got to share many laughter moments and photos with Víctor Tomàs, as well as being able to watch the match from the “Llotja” of the Palau Blaugrana. Through this charity sweepstake, together, Víctor Tomàs, Montse and other participants have helped the Foundation of the Children Hospital to be able to offer a higher quality healthcare to children and juniors that don’t have access to much resources. As well as, helping to solve one of the world’s problems since this struggle does not only exist in Spain but also in other places such as Honduras, Guatemala, and Burundi. What was the first thing you thought when you discovered that you were the winner? “I could not believe it … I had a lot of friends from different cities who had also participated! How did you feel watching the match from the VIP area of ​​the stadium? How was the meeting with Víctor? Travel to Barcelona and stay 2 nights in a first-class hotel. Enter now to become the winner of this amazing experience!